If you are a person that does laundry on a daily basis then one of the biggest dilemmas you will probably face is making the choice between buying a garment steamer and an iron. Both of these appliances have their respective advantages and disadvantages. To choose the best one you have to understand the respective pros and cons with respect to your personal needs. This article is a discussion of some of the benefits and drawbacks associated with both garment steamers and irons. A garment steamer is a great appliance for getting rid of the wrinkles in your clothes. Rather than ironing, all you have to do is set up your handheld garment steamer and get rid of the wrinkles. It is far much easier than ironing. The garment steamer works by placing your item of clothing on a hanger and letting it hang. From there, run the steamer up and down the garment and you will see the wrinkles disappear. You can use the garment steamer on clothes of virtually any fabric type. With the steamer, you need not worry about using it on any item of clothing in your wardrobe including cashmeres and silks. If you desire to reduce your never-ending dry cleaning bills then you should get yourself a garment steamer. Garment steamers can bring your clothes to considerably high temperatures and this helps get rid of allergens and bacteria that may be residing in clothing items. Garment steamers are particularly effective in pressing heavy fabrics that have been hanging at the back of your closet for a while. 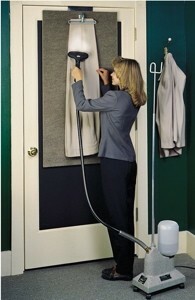 Garment steamers are not only effective in pressing items of clothing but also drapes too. In fact, garment steamers offer a level of convenience that regular irons simply do not. When using the garment steamer on drapes you never have to go through the hassle of removing them. This is because you can use the steamers both horizontally as well as vertically. Garment steamers are also quite easier to use than irons and you can save much time pressing your clothes using them as compared to irons. Conventional irons generally offer a combination of both steam and heat while a garment steamer offers constant steam. This means that by using the conventional iron, you could potentially ruin your clothes if you fail to use it correctly or if you leave it on one spot for too long. The steamer on the other hand provides a steady flow of steam to un-wrinkle your items of clothing properly and evenly. Even though garment steamers do bring a sense of convenience to the process of pressing, in terms of performance they are not as useful as conventional irons. This is especially true if you would like to ensure that shirts have crisp cuffs and collars. Conventional steam irons are also quite effective in eliminating crease lines in clothing. Since steam irons provide you with sharp edges unlike garment steamers, they are more effective for pressing seams. 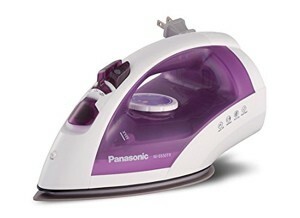 Today, considerable advancements in technology used in modern irons have made it possible for them to produce almost as much steam using a steam iron as a garment steamer. Since irons are increasingly getting cheaper, one might opt to go for the iron that can produce steam. Even though you cannot use a steam iron to press and clean drapes, you can still use it to give your clothes a fresher look and kill bacteria that may accumulate. Many people that work at home state that a home is never complete without both the steam iron and garment steamer because they serve different functions. Since both the steam iron and garment steamer are equally affordable and do not take up much space then it is advisable to buy both of them.